Editor’s Note: This is an opinion piece submitted by Eric H. This is not an official position by CHPN. Several people, including myself, have noted a serious accelerated deterioration of this building’s condition… to a point of an imminent wall (structure) failure. One person said they have noticed it going from “bad to worse”. This is the oldest commercial building in Richmond (built in 1815). It is an important part of Richmond history that has to be preserved. New voices need to be heard at the Building and Planning Commissions as well as City Hall, to save this building from ruin. Spot Blight Abatement is one option and attempted (unsuccessfully) before. The owners (and city) have had 14-years to do something but have dropped the ball many, many times as well as cast a blind eye. It is time that something is done. The “Wills Grocery Store” spent the first 131-years as various grocery and meat-seafood markets. From 1947 until 2004, when it was condemned by the city and then gutted, it was a Laundromat. There were plans to turn it into a restaurant but needed exceptions for a building use change and zoning at the time required several “off-street” parking spaces, which were not available. This was shelved citing a resentment that people were “meddling” in their business, which involved avoidance of CAR required plans, following through with them, or doing work without required permits and inspections. By 2008, there was talk about demolition, which I intercepted. There was a load bearing wall breach where you could put your entire arm through into the building and only mortar slapped into it as well as foundation problems and anchor plates reaming through the bricks. City Council agenda for September 22, 2008, showed that former governor Doug Wilder (mayor Wilder then), was pushing for Spot Blight Abatement proceedings on the building, entering Ordinances #2008-201-283 and #2008-202-284 in accordance to Va. Code §36-49.1:1… and were approved in December. The owners did not comply even though the approval was final and sent to the Planning Commission with them saying that it would not be stopped no matter what the CAR decides. They never followed through. In 2010, the building was quietly offered for sale at $500,000 which no one would touch and just another way to drag things out. The Abatement proceedings were still “being worked on” and a Fair Value Assessment was done as part of it which came back as $105,500. The HRF was interested and pursuing on purchasing the store but this was the last straw for them at that time and invested elsewhere. Again in 2011, this came up on the table with the owner needing a Certificates of Appropriateness to be filed but ended up going to court due to failure to meet requirements. Even as violations were piling up to be corrected, either new plans or ownership changes were submitted at the very last minute as stall tactics and then, the city letting things fall through the cracks. The Wills building is 203-years old and is made of brick. It is a gutted brick shell which needs special attention. It sat open to the elements for nearly a year with no second-floor windows. There was a rear wall rebuilt in 2006 but with inferior construction and supposed to be replaced but never was. Now, another wall is being breached and poised to collapse due to neglect and possibly, a desire by the owners to let it so they could sell the lot. One person doesn’t make an army and my voice is no longer heard and so now, new voices are needed. if restored properly, there is a great potential with all kinds of tax credits and incentives available. Under that ugly stucco are brick walls in the American Bond pattern with arched windows on both floors and both sides of the building, including the first floor on Marshall Street. I’d love to know if the cities of Charleston and Savannah would have allowed something like this drag on for more than a decade. Richmond seems to support demolition by neglect by giving a slap on the wrist to property owners and/or slum lords whose properties blight the city. A pathetic situation. We are told in the story that this is an important part of Richmond history, but the only historic thing about the building apparently is its age as the oldest commercial building standing in the city. Age alone, even if something is the oldest, does not by itself make a building historically valuable. The building was an otherwise unremarkable grocery store and a laundromat. This isn’t St John’s Church. It’s not even the first Ukrop’s. It’s an old building and perhaps the oldest left of its mundane kind. That’s it. There are others similar that are not crumbling. They just may be a few years younger. Still old. Still maintaining the architectural style. 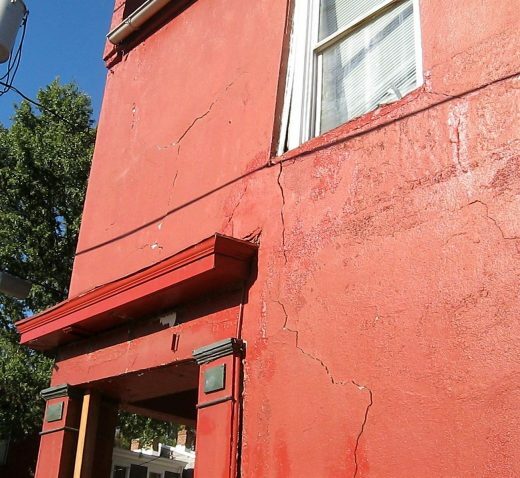 While we all want to preserve the visual character and history of the neighborhood, not every structure is salvageable. If I can stick my hand through the wall of the buikding and it is that structureally deficient, then it is a hazard, it’s been like that for more than a decade. In a period when people are throwing money into rehab, this hasn’t been resolved on a valuable corner. Even if you rehab it, how much original material would be left? At some point isn’t the rehab a replica if nothing original remains other than the land it’s on. 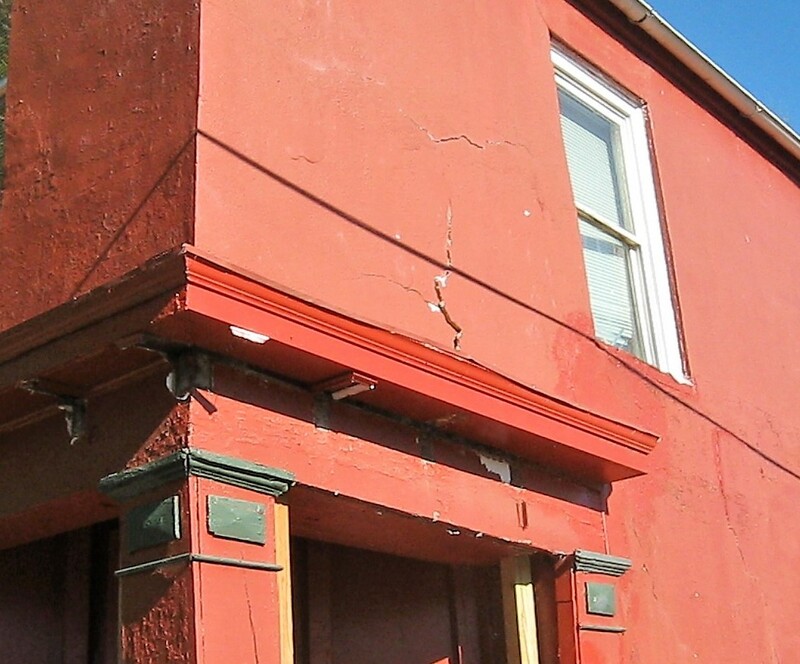 Even in its very poor condition, the building is probably worth $200,000 to $250,000. 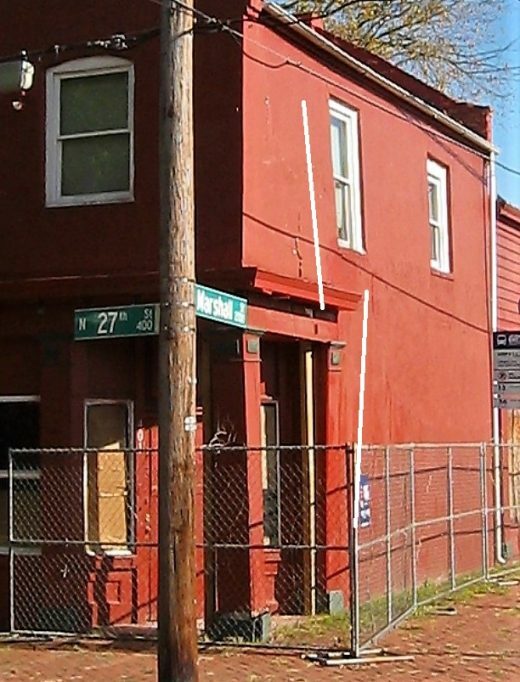 City records show September 2008 as the most recent “valid” sale of this property (in the amount of $119,000). If the owner could double her money in 10 years, that seems like a good return (except for capital gains taxes). I would think that if a motivated buyer wrote her and offered, say, $240,000 (subject to inspections) the owner could make decent money and unload what is probably a headache. So, will some investor step forward? That is probably the only realistic solution. But, of course, I have no knowledge of the particulars, so am just shooting from the hip here. I can totally understand why people walk away from plans to do anything with this building with all the meddling and intercepting. As usual a derelict building is preserved just because of age and stands in the way of progress. The preservationists people need to put up there own capital and fix it or mind their own business and let others invest their money how they see fit. What has all the meddling got the community except ten years of lost revitalization and increased tax revenue? Mike Proffitt & Manuel A Ramos, this is the building we were talking about last night. So, this is going to sound crazy, but I remember a few years ago there was a for rent sign on the side/rear of the building. I called the number and was told that the person I spoke with was looking for a tenant for the upstairs apartment. The person I spoke with told me that only the downstairs was condemned. While I think that it is technically possible to have a portion of a building or a specific unit condemned, but not the whole structure, I passed after looking at the ground floor more closely. I mention this story because on more than one occasion I have noticed lights on in the upstairs windows of this building. Which is concerning, if it indicates someone is living there. I don’t know about the issues described by Eric, but the pictures speak for themselves – I find it… implausible that this structure is safe to live in. I investigated this a few years back and posted on CHPN. They had their struggles as well but have a few major difference than Richmond. Places like Charleston, Savannah, New Orleans, Georgetown, etc… have activism, review committees, and cities interested in embracing its history which also leads to tourism and income from it. People in Richmond don’t want to “get involved” and even tries to sweep history under the rug (a different story). City council and staff seem to have little to no interest in preservation or promotion but rather let it rot, tear it down then do nothing with the property. Once it is gone, it’s gone forever. We have had groups come and go due to the lack of involvement or commitment by members, which is a sad state of affairs. * They are more than twice as likely to prefer shopping or eating in historic downtowns (52%) and in places with historic appeal over malls and planned commercial districts or recently constructed places. If Richmond is a magnet for Millineals, then where are they mentioned above? I have learned that the HRF (Historic Richmond Foundation) has asked to reinitiate the Spot Blight process. That the first try in 2008, by mayor Doug Wilder… and the Building Planning department, who was adamant that it would go through no matter what the CAR said, was dropped when the owners did “just enough” to get the building out of this status. But years of “just enough” has lead to the building ending up the way it is today. In fact, there is a current building permit for $1,000 worth of work to stabilize a column at the entrance but the problem is much worse and only part of a bigger issue with the wall. There are other structural issues as well. I did some research on this building a few years ago. Let me know if how I might be able to support in some way. I’ll message you. Kevin Clay wow what a interesting read!!!! The building has been through a lot due to the owners (and city). It has been condemned, gutted, threatened demolition, foreclosures, neglect to a point of Spot Blight, poor repair work with some not permitted, and now this – and that isn’t everything I have seen in the past 14 years. SA Chaplin – Yes , you are right about the valuation. The transfer to the current owner was done as a “gift”, so no money was actually changing hands. I fear that the previous owner of record did not do this out of the goodness of his heart, but rather as a way to dodge the City and the pressures that were being brought to bear on the property. The return on investment for a developer to acquire the property and restore it for practical use is prohibitive unless the sale price would be reasonable. The only viable alternative is for Historic Richmond to line up some donors to fund the purchase and rehabilitation. That seems to be an unlikely possibility with the current attitude of HRF. The only other option, as Eric has stated many times, is for the City to step in, condemn it and resell it for a nominal fee. But, there is the problem – the City. They can’t even get their Permit and Planning Offices in working order. Try to get permits for any rehab projects and you would know what I mean. Pitiful! Eh probably about time to tear this down and put a new coffee shop in. @2 BAF, I think we have had this discussion before, several times in fact. With your philosophy about preservation, there would be no historic and preserved buildings left, let alone any historically designated neighborhoods. Tell me, what “significant” houses are there in the Chimborazo district or, Shockoe or other neighborhoods outside Church Hill? Not all structures need to be grandiose or George Washington slept there. Even the commoner structures have value to the history and heritage of neighborhoods. I think you may find this a good read for you about “Why Historic Preservation Districts Are Crucial To Cities” It also points out the economic aspect that it is usually cheaper to restore than build new, and reduces the carbon footprint. @4 Joshua, the only “meddling” has been only concerns by people who wish the right thing to be done, and properly, to this building. And any “intercepting” was caused by the owners and/or contractors doing work without it going through the city. This includes the CAR as well as obtaining building permits. I understand that the owner has a reputation for doing work without permits. When dealing with a commercial structure which will be occupied by many, this is even more important to follow the rules. It is valuable being “the” oldest and that in itself is an important factor no matter the esthetics. @6 Lee, About the 2011 apartment buildout. That is a question that has baffled many. How can a “structure” be considered safe and occupant ready when it sits on top of a “condemned” building? The answer is given above when the owners would do “just enough”, for the city to look the other way… often, after certified letters had been sent, and court appearances. In other words, these people are defiant in what they will and will not do with the property. There is even an old Condemned Notice still posted on the door from 8-years ago for lead paint, which has not been fixed. @12 Bill Hartsock, Patrick C. Murray purchased the building from Charlie J. Johnson Jr. (4-corners Charlie) in December 2003. After a court visit, there were several code violations that needed to be fixed within a 45-day period and it was at this time they put the building on the market at that ridiculously inflated price to, as you eluded to.. dodging responsibility. This is where things get a bit convoluted. The property was deeded to Walter S. York III September 10, 2008. A year later on September 8, 2009, there was a Deed of Gift between him and Lessie Marie Hembrick but it also says they owned half share of the property. Then one month later, a Deed of Trust was written between them to Trustees Duane A. Deskevich and Andrew C. Harris of law firm Cawthorn, Picard, Rowe, Deskevich & Gavin, PC, with a Beneficiary of Pratima Prasad. But with the city Tax Assessor’s office, it only shows Hembrick as the owner? The Deed of Gift was another dodge or stall, as you suspect. It seems that whenever the city would close in and demand their intentions, they would transfer the property to start the clock over since there are new owners involved. But, all of these people are related as family. This also brings me back to a statement I overheard when Charlie Johnson and Patrick Murray were in the street one day and spoke loud enough for everyone within earshot could hear that they would “never sell to whites” and the building was their birthright. How is that when Charlie Johnson did not even own it until 1968? He was living on M Street at the time. This occurred right about the time their restaurant plans fell through in 2008. A lot of things with this building, or rather didn’t, that year. A friend lived in the apartment on the second floor. It was a great space. Yeaaaah someone is definitely living there. Eek. The “Wills” buildings, 401 N. 27 and 407 N. 27 (I restored 407 in the mid-1980s) are both architecturally and historically important. Wills owned the entire block, with numerous outbuildings (documented by insurance plats). Because N. 27th street was the road heading north out of the City, Wills’s Store was an important business. The City and H.R.F. have been duly negligent in allowing this to happen. I am not surprised. @17 dan harrington, Jim Butcher and I are still living at 407 and it is me who has been on top of the history as well as the happenings. I have tried to contact you in the past to ask some questions? Also, both 401 and 407 N 27th, were anchor structures instrumental in obtaining the “Church Hill North Historic District” designation in 1996. Dan Harrington, through further research and tax records, I was able to determine that our house was not built in 1812 but is older and built in 1809 and makes it the oldest standing house in Church Hill proper. I also discovered that Capt. Wills may have also built what is called the Samuel G. Adams house, built c.1813 at 316 North 27th Street. That is because the property was transferred to his son Josiah Wills after his death in 1820 and there are peoperty references. Historic Richmond can anything be done? Grayson – You are barking up a tree that has withered from neglect and lack of mission. 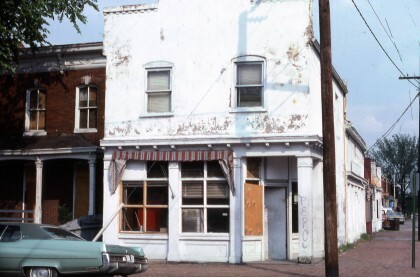 Back in 1982 the organization bought many properties in Church Hill from Stanley Smith, including Eric’s house, to resell to dedicated preservationists to spark the renovation of the area. It worked well and jump started the neighborhood. Now, however, nothing is going on with that organization that reflects their mission or importance. Sad. Bill, a LOT of groups and incentives have fallen to the wayside over the years, like the Church Hill North Civic Association. Whatever happened to Neighborhoods In Bloom? In 2011, members of a grassroots group that I was a part of, dropped out like rats on a sinking ship. Why? Is it because fighting City Hall is futile when your objective doesn’t align with theirs, even though it should? We had movers and shakers from all walks of life in the group but many just dropped out for one reason, or no reason, or another. Some did not want to be in the limelight by rocking the boat but without a voice, nothing gets done. It has to be a collective voice with our city. Back in 2010 when the HRF was interested in buying the building once the city was supposed to have followed through with the Abatement process, made it clear that their only interest was to buy, stabilize, and sell. They have restored a couple of structures since but not sure if they would have with this one which now is becoming a potential money pit. More recently, they did show an interest again to get the proceedings going so they could secure the building before Donnie Glass and Grisette Restaurant stepped into the picture. Apparently, Glass still has a lease option once restorations and fitting out is done but it looks like that will be never at this point unless the city steps in, as they should have 10 years ago before it got to this point. As I said, there has been a request made by the HRF to try and start the Spot Blight Abatement process once again. @eric I’m sorry but what do millennials have to do with a 200 year old crumbling building? I get what your saying I see it all over town…like you think some post grad kids have the equity to spend on it to fix it? Sorry for all the questions just seems like your expecting 20 something’s to fix something that’s beyond repair. Tim T – If we waited for the millennials to get involved with the community we would all die an unfulfilled death. The “me” generation cannot see past the last bar and restaurant night that they had, or what social event is on the horizon. @23 Tim T, let’s face it, my generation (Baby Boomers) are dying off and the US Census Bureau projects that there will be more Millennials than Boomers next year. “Time” magazine last year said that Richmond was #2 of the top 25 cities in America where Millennials are moving to. I even know that there are companies in the city who only hires Millenials and so, my statement is a legitimate one. It is Millennials (age 20-35) the older ones, who are now buying houses and more so as they get older while Boomers die off. @24 Church Hill Veteran… so true but, when you can’t seem to get the pioneers involved and can’t get newbies interested, what do you do? The city can seize the property from the owner if the building becomes so blighted that it is a safety hazard through a Spot Blight Abatement process. The HRF is attempting to get this going. it’s, uh, pretty weird and not great to call yourself a ‘pioneer’ because you moved to a largely minority neighborhood before other white people did. @28 what the… I wasn’t calling myself a pioneer but the people who have been here for generations. The preservation started in 1957. But, if you want to call people who took a bunch of blighted, abandoned, boarded-up houses and restored them in the 1980s and beyond then, they too are pioneers in preservation as well no matter their skin color. I think we have had this discussion. I am all for saving older properties, just like I want to provide health care for older people. But sometimes, in both cases, you have to pull the plug. This appears to be the case where the patient is dead, but you refuse to pull the plug, leaving everyone on the hook for the costs. Let me be crystal clear. One of the most appealing things about the neighborhood are the vintage structures. I would prefer to preserve and rehabilitate all that are reasonable to do so. But that assumes you are preserving structures that are in a condition that is reasonable to rehabilitate. Your own description of the property would not indicate that. Instead you want to bring your absolutist view that no building may be lost, no matter how decrepit or economically unfeasible it may be to rehabilitate. In that scenario–and it seems this building falls into the category, what people who feel like you do is HINDER rehabilitation and PERPETUATE blight by forcing someone to do the impossible or impractical in order to make the property usable. You are becoming a part of the problem, leaving that block blighted far longer than has been necessary. At that point it stops be historic preservation and becomes historic fetishism. You would protect one building while dragging down the surrounding values, making other rehabs less feasible. You are, as I said, saving the tree while killing the forest. But I fully expect you will keep fighting for your fantasy of rehabbing the structure. I mean, you’ve made such progress after a decade-plus. Don’t be surprised. Based on some conversations I have participated in with Eric on Nextdoor, he has some archaic views on these issues. A new year, a new post about this historic building which continues to deteriorate. The wall separation (crack) is worse as is the bowing and twisting of it. There is a new notice taped to the window by the city dated December 18th but only addresses the “fascia and soffit” by the entrance support, which had been taken down months ago but not fixed and replaced. It says nothing about the more pressing issue with the compromised north (Marshall Street) wall. I am sure the person that signed off on the notice, who is from the Building Maintenance Inspections department, would have also seen the wall issue. What is up with that? Cite them for decorative issues but not structural ones? The city gives them until January 18th (1 month) to fix it or face a $2,500 per day fine plus court costs. Right now, as it stands and all that I know about the current status, is that the CAR is waiting for the owners to be compliant. This will obviously not happen as their deadline is today (January 18th) and no work has been started to repair it even though they were given a month and have missed the deadline to complete repairs. I doubt that they have the funds or means to fix the building as it stands now in its condition. And I know for sure, they will not pay the $2,500 per day fine plus court costs. The ownership has been through both mortgage trusts and second mortgages in the past as well as early on, in and out of foreclosure. Possibly after 15 years, the owners have lost the battle and the city will start proceedings but we need to know for sure. Six days have passed since the deadline and the fines should be racking up to $15,000 plus court costs and climbing. There is zero activity and no new building permits but at the same time, no response from the city either. I will give them a phone call in the morning. In the meantime, a blast from the past. Here is a 2007 post on a now-defunct Yahoo! group for Church Hill started by Laura Daab and this is one of my post that just goes to show, things have gone nowhere with this building over the past 14 years. And the plans were never completed nor the work to comply yet, it was “overlooked” by the city. Nearly 2-months has passed since the deadline and a warrant was supposed to have been served by the sheriff department. What is the holdup? I know that servers are usually relentless. I also know where the owner works if that helps if they can’t seem to get them at home? In the meantime, the building is getting worse. Watch NBC12 news this afternoon and evening. There should be a report about this building and from what I have heard, could be a series of follow-ups considering what has or has not happened over the years. New development. Today, the owner installed a foundation beam jack support on the corner of the building falling apart. It has no permit and unless the building co-owner (Walter York) is an architectural engineer (he is just an independent contractor), then what was done could cause more damage than good and could accelerate the collapse. Keep in mind that the wall is only 2 bricks thick. They are made from 204-year old fragile pre-code bricks and mortar which currently has fallen out in many places and the removal of a fascia over the entrance to install the support exposes even more damage.